Yesterday's Perfume In the News, "Vintage Life Magazine," and "The State"
I often forget to post things that are not vintage perfume reviews here on Yesterday's Perfume. So I'm going to do a bit of self-promotion. And finally, a while back I stumbled on a Huffington Post article that named Yesterday's Perfume one of the top 17 perfume blogs. It was third in the slide show list. Wheeee! You can check that out here. Many of my favorite blogs were not on the list, but it was an honor to be recognized. 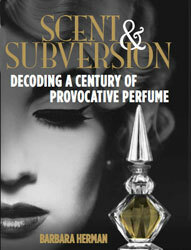 And don't forget, my book Scent and Subversion: Decoding a Century of Provocative Perfume (Lyons Press, 2013) is coming out November 5th. (Here's the Amazon link with the old cover; you can pre-order if you wish!) I'll post a reminder, with an image of the new cover, soon, and I'm starting to put together some events for the launch. I'm pretty excited! For your readership, friendship, and comments, and whether you're new to Yesterday's Perfume, or go way back when with me — thank you! And if you ever want to chat on social media, I'm on Twitter.com/Parfumaniac, and will respond to anyone who says, "Hello"! Hi Barbara, I'm so glad to see you getting published all over the place, including here again. Many, many congratulations! I will be pre-ordering your book with my next pay. I'm a bit broke at the moment (that bottle of Cuir de Lancome I bought last week may have something to do with it.) I just can't wait. Nor, I'm sure, can you! Sweet Anne-Marie! Good to hear from you.Thank you for your support. I whole-heartedly agree with postponing spending money on books in favor of perfume! Drop me an email to let me know what youre up to! Im started to blog a bit more again, so your insights would be nice. Take care!